Available to order from October, the hybrid version of the fifth-generation SUV joins the existing petrol model that went on sale a month ago. As announced at the start of 2018, no diesel powerplants will be offered. Although Marc Samuel, Honda UK’s fleet sales operations manager, told Fleet World earlier this year that it was a “bold” move to take out diesel from the range, he said that the timing was right as a growing number of fleets – including the model’s public sector heartland audience – switch to alternatives, including businesses previously wedded to diesels. The petrol engine is expected to find favour with emergency response fleets looking to move on from diesel models but the forthcoming hybrid will add impetus to the drive to shift fleets away from diesels. Comprising a 2.0-litre i-VTEC Atkinson cycle petrol engine, two electric motors and a lithium ion battery pack along with a single fixed-gear ratio, the Intelligent Multi-Mode Drive (i-MMD) hybrid system will automatically switch between three driving modes – EV Drive, Hybrid Drive and Engine Drive. 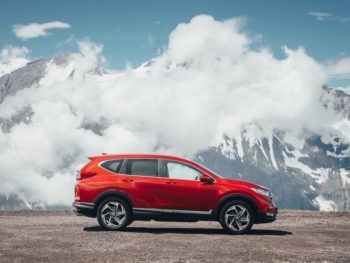 Honda says that at a moderate cruise, the CR-V Hybrid will typically run in battery-only EV Drive for more than half of the time, whilst at faster speeds, the car will be in EV Drive for approximately one third of the time. Drivers will be able to use a Vehicle Driver Information Interface (DII) screen to see which energy sources are being used to power the vehicle and the recharging status of the system. First customer deliveries of the CR-V Hybrid start in early 2019. Fuel and CO2 figures and pricing will be announced closer to the launch.